I have been reminded that Alan Davies died twenty years ago today when, tragically, he took his own life at the age of 30. An elegent and creative midfielder, Alan made 127 appearances for the Swans in two spells at the club between 1987 and 1992. He began his career at Manchester United, for whom he appeared in the two games of the FA Cup Final v Brighton in 1983 , and he went on to play for Newcastle United. He won 13 Welsh caps. 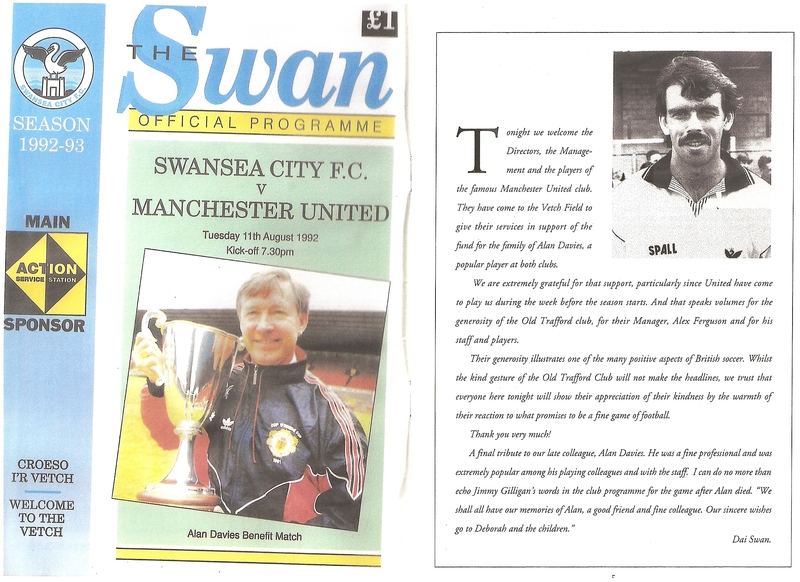 Alan’s death was a great blow to the club and its supporters, as well as to his family and friends, and it was entirely fitting and appropriate that a benefit game was played against Manchester United at the Vetch on 11 August 1992. As the note in the benefit match programme states, he was a very popular player who was much missed by many people connected with the club.